After work yesterday I had a fun trip to town to do some shopping at the Salvage Store. This is a great place that sells dented, overstock and almost expired products. I know some people have issues with shopping for food at these kind of stores, but I have no hangups at all. It is a great place for food shopping for cheap! All you have to do is take the time to look at the dates on packages. Being that I spend extra time looking at sodium content anyways, I don’t find it cumbersome at all to check dates if it means I get good deals. One of the things I love about our local Salvage store is that they have a produce section. Every Wednesday they get in various vegetables, bags of salad, fruit, and yogurts. It is always different items, so it is hit and miss as to if they will have things I want or need. This week was a great week! 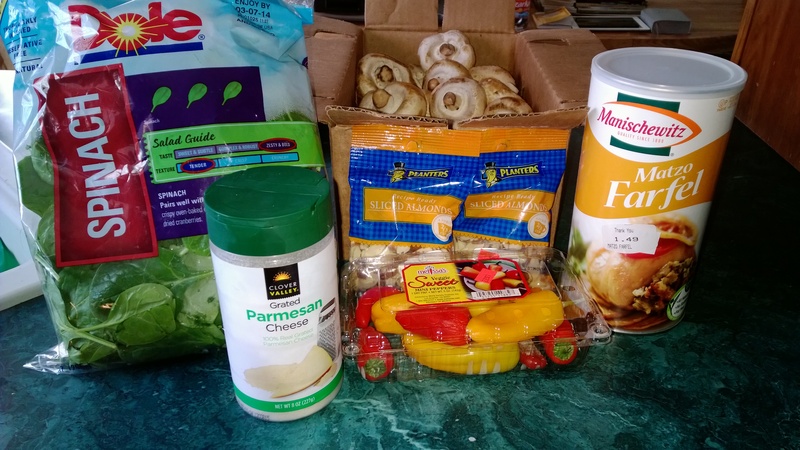 They had tons of packages of spinach for 99 cents each, 3lb bags of apples 2 for $3, and 5 lb boxes of mushrooms for $3! I also scored crumpets that I like to toast for breakfast, that have only 90 calories and 100mg sodium. Great alternative to english muffins. The freezer section was also a wealth of Steamables, microwave veggies and rices., I am fully stocked with white rice, peas, corn, and brussel sprouts that will be easy to toss in the microwave at work or on the inevitable nights i work late. Since I now had 5lbs of mushrooms to contend with, it quickly became a day of cooking mushroom dishes! I did a wonderful pot of mushroom vegetable soup. I used low sodium vegetable stock, all spice and coconut milk to make a great broth with a lovely asian flavor, added snap peas, baby carrots, and large chunks of mushrooms. Simmered for 2 hours and added a whole bag of kelp noodles. This whole pot of soup only used about one pound of the mushrooms, so I moved on to a fun new stuffed mushroom! 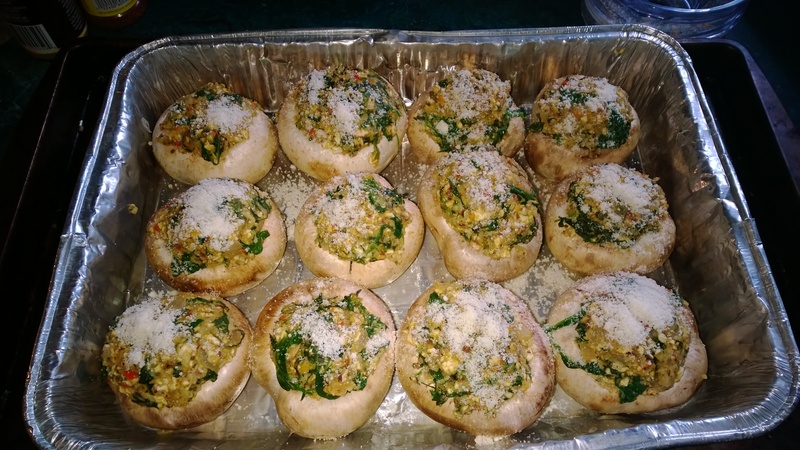 Spinach, Bell Pepper, Almond Stuffed Mushroom. I started with 1 tbsp unsalted butter, 1 cup chopped vidalia onion, 3 tbsp chopped garlic. 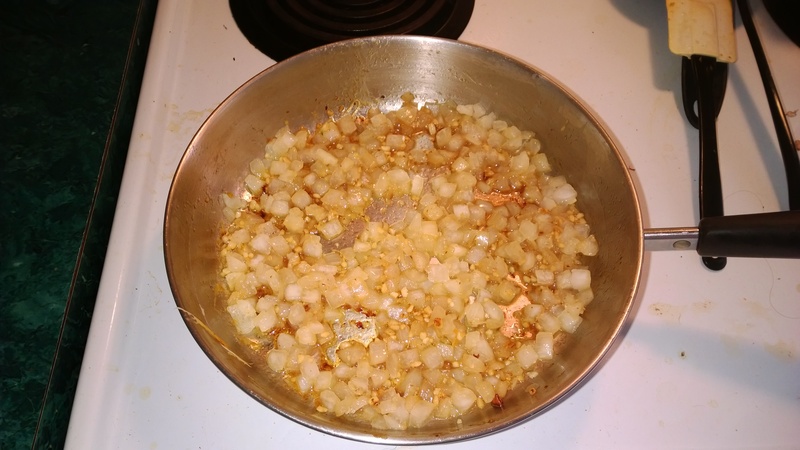 Saute the onions and garlic in a skillet until nicely browned. Remove tops and seeds from approx 10 mini sweet bell peppers and chop or put in a food chopper to get a fine chop texture.Add to the skillet of garlic and onion and continue to saute. While this is cooking wash and remove the stems of mushrooms. My mushrooms are father large so I used 24 of them. If you have smaller button mushrooms you can prep as many as you want to and adjust the mixture accordingly. I placed the mushroom stems and 1 1/2 cups of raw unsalted almond slivers in the food processor and make a fine ground. Place in a bowl and put to the side. Add 3 cups fresh spinach in the skillet with the onion and pepper mix and cover to let the spinach heat and begin to wilt. You can also stir it all together to speed the wilting process. When the first 3 cups have wilted and there is room in the skillet add another 3 cups of spinach and repeat the wilting process. 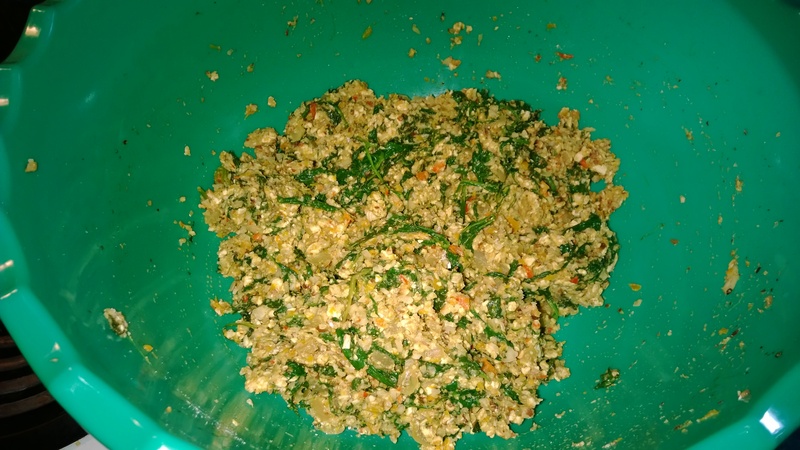 While the spinach is cooking, mix 1/4 cup grated Parmesan cheese, 1/8 cup salt free herb seasoning mix, 1 1/5 cups matzo crumbs (i use matzo farfel because it is sodium free, you can use bread crumbs or panko if you like). Grind in the food processor to a fine crumb mixture and put in the bowl with the ground mushroom and almonds. Add the hot spinach and pepper mix to the bowl and mix all the ingredients together to make a nice stuffing texture..
Use a spoon ans generously stuff your clean mushroom caps and place in a casserole dish, I made a large batch so I filled 2 lasagna trays. Sprinkle the tops of the mushrooms with Parmesan cheese. Cover the dish with foil and place in a 300 degree oven. If cooking large mushrooms like mine, they will take about 1 1/2 hours. 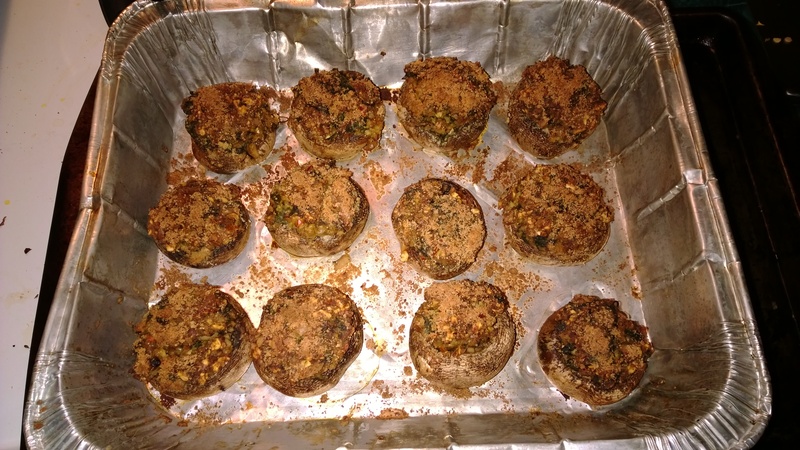 If you stuffed smaller mushrooms they will only take about 45 minutes. Just keep and eye on them and cook until the caps are cooked all the way through. When they are almost finished cooking, remove the foil and let brown in the oven for the last 15 minutes. I was very happy with the outcome of this dish. The large mushrooms I did consist of about 75 calories each and only 45mg of sodium! You can eat a whole plate full and feel no guilt! I paired 3 of them with freshly roasted brussel sprouts and broccoli for dinner! Hope you enjoy this mushroom as much as I do! I love a good stuffed mushroom. 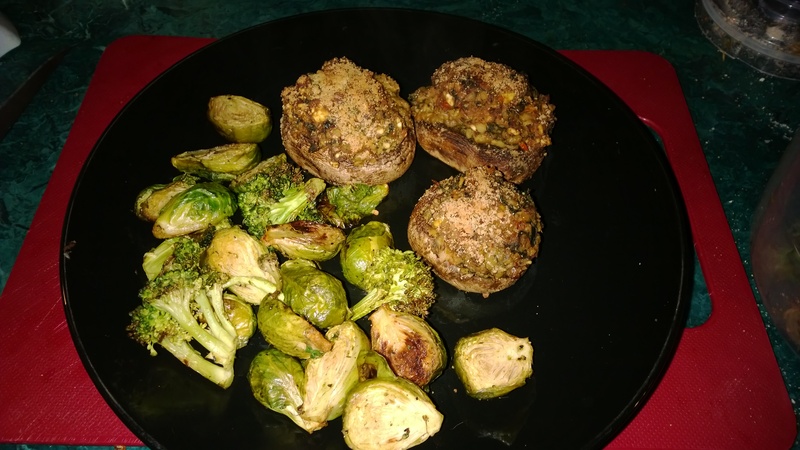 I have so many variations on stuffed mushrooms, I could do a cookbook just on mushroom stuffing! Enjoy all the flavor, with none of the salt! Your taste buds and heart will thank you!! It was a really good activity day today. I think it was due to the nerves driving me to get in as much cardio as I can before my tests. Started the morning with a nice mile walk with Sammie dog. Managed to take time at lunch to get in another 3/4 mile. And even got in an after work walk with Sammie dog again. According to my FitBit tracker, I got in 7600 steps so far today! Not bad at all, and I feel great! Tonight’s creation is 98% lean turkey patty, topped with creamy Swiss cheese, sautéed mushroom spinach and Vidalia onion, on a bed of kelp noodles. The meal is super simple, spray a sauté pan with cooking spray and start to cook onion and mushroom on low heat so they sweat and make a nice moisture in the pan. Add fresh spinach and mix. Cover pan so the spinach will sweat and cook down. In a skillet, spray with cooking spray and cook turkey patty until fully cooked, turning half way through to evenly cook both sides. In the last 2 min top the patty with Swiss cheese and cover skillet to help steam melt the cheese. While the Swiss in melting, go back to the mushroom and spinach mix and take a spoonful and put on top of the Swiss turkey patty. With the rest add a handful of rinsed kelp noodles and 1 tablespoon low sodium Worcestershire sauce and mix thoroughly until noodles are warmed through and softened. You can add any no salt spices you would like to taste. I love just the natural flavor of mushroom and spinach so I don’t add any spices to this dish. Place the noodle mix on the plate and top with the turkey patty and enjoy! Healthy and filling dinner for only 256 calories, 10 carbs and 211mg sodium! Thanks to the kelp noodles we cut approx 200 calories that traditional spaghetti noodles would add, as well as cut approx 35 carbs! Grab a big plate, eat up and feel no guilt! Your heart will thank you! On a lovely Saturday afternoon, with the breeze blowing through the open windows and the sound of cows in the back ground, it is a great time to toss and roast a variety of fresh veggies to snack on! I have found this to be the easiest salt free healthy snack to give me the sensory crunch that is can snack on all day without guilt. I do a whole tray full and then put in a Tupperware container and just leave on the counter to snack on all day as I do stuff around the house. Cut fresh veggies to medium chunks. You can use anything you like. Today I did baby carrots, broccoli, cauliflower, and brussels sprouts! Toss the veggies in 1tbsp of oil, I prefer coconut oil but you can use any oil you like! I have used peanut oil also for a fun taste. Once the veggies are coated lightly in oil, I like to sprinkle with salt free seasoning. Today I used Mrs. Dash Caribbean blend. There are so many good salt free blends that it is almost limitless possibilities of flavor. 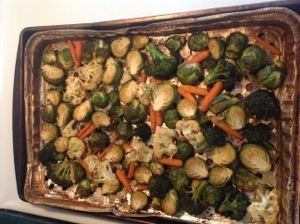 Spread the coated seasoned veggies on a cookie sheet in a single layer. Place in oven and roast until desired doneness. I like a little crisp on mine, so I leave them in for about 30-40 min, until the smaller pieces start to blacken on the edges. Take them out and let cool until you can eat them. I like them just by themselves, but you can use any dip also if you like! Walden farms make a couple good calorie free, carb free, gluten free dips, but they do contain sodium so best to use just a little bit of them if your diet is very sodium restrictive like mine. 1. If the artichokes have little thorns on the end of the leaves, take a kitchen scissors and cut of the thorned tips of all of the leaves. This step is mostly for aesthetics as the thorns soften with cooking and pose no threat to the person eating the artichoke. 2. Slice about 3/4 inch to an inch off the tip of the artichoke. 3. Pull off any smaller leaves towards the base and on the stem. 4. Cut excess stem, leaving up to an inch on the artichoke. The stems tend to be more bitter than the rest of the artichoke, but some people like to eat them. Alternatively you can cut off the stems and peel the outside layers which is more fibrous and bitter and cook the stems along with the artichokes. 5. Rinse the artichokes in running cold water. 6. In a large pot, put a couple inches of water, a clove of garlic, a slice of lemon, and a bay leaf (this adds wonderful flavor to the artichokes). Insert a steaming basket. Add the artichokes. Cover. Bring to a boil and reduce heat to simmer. Cook for 25 to 45 minutes or until the outer leaves can easily be pulled off. Note: artichokes can also be cooked in a pressure cooker (about 15-20 minutes cooking time). Cooking time depends on how large the artichoke is, the larger, the longer it takes to cook. Artichokes may be eaten cold or hot, but I think they are much better hot. They are served with a dip, either melted butter or mayonaise. My favorite dip is mayo with a little bit of balsamic vinegar mixed in. 1. Pull off outer petals, one at a time. 2. Dip white fleshy end in melted butter or sauce. Tightly grip the other end of the petal. Place in mouth, dip side down, and pull through teeth to remove soft, pulpy, delicious portion of the petal. Discard remaining petal. Continue until all of the petals are removed. 3. With a knife or spoon, scrape out and discard the inedible fuzzy part (called the “choke”) covering the artichoke heart. The remaining bottom of the artichoke is the heart. Cut into pieces and dip into sauce to eat. As much as we may dislike them, the stickers or labels attached to fruit do more than speed up the scanning process at the checkout stand. The PLU code, or price lookup number printed on the sticker, tells you how the fruit was grown. As reported by Maria Gallagher, in the June 26, 2002 issue of the Philadelphia Inquirer, by reading the PLU code, you can tell if the fruit was genetically modified, organically grown or produced withchemical fertilizers, fungicides, or herbicides. The numeric system was developed by the Produce Electronic Identification Board, an affiliate of the Produce Marketing Association, a Newark, Delaware-based trade group for the produce industry. As of October 2001, the board had assigned more than 1,200 PLUs for individual produce items. Incidentally, the adhesive used to attach the stickers is considered food-grade, but the stickers themselves aren’t edible. Do you REALLY know what’s in your dinner? Today, 7 out of every 10 items on grocery stores shelves contain ingredients that have been genetically modified. In other words, scientists are using new technology to transfer the genes of one species to another, and these altered foods are in the market stream. And yet many scientists have concerns about the safety — to people, wildlife and the environment — of this process. That’s why consumers in Asia and Europe are demanding that their food be free of genetically modified ingredients. I had fun today, got experimental and made burger patties out of mushrooms. I read somewhere that you can use mushrooms in place of ground beef, so i decided to have a go at burgers! They came out delicious, I may prefer them to the ground beef burgers. Next we will have to try them on the barbecue grill and see how they hold up. I was only cooking for myself tonight, so this is just the ingredients for one burger. Increase according to the servings desired. Use a knife and hand chop or use a food processor to finely chop the mushroom. In a bowl add panko, seasonings, mustard and egg white and mix thoroughly until fully combined. Form into a patty. Heat a skillet on medium heat and spray with butter cooking spray. Cook patty until browned and crispy one each side. At this point you might want to melt cheese on the patty or grill onions to top the burger. You can also eat the burger patty with lettuce or cabbage wrap instead of a bun. We had a few days of humid and rainy weather so the BBQ has been out of commission most the week. However who can pass up a good Chicken Kebab? It is such a simple meal to put together. As I have stated on many occasion I love the natural flavors of vegetables. This certainly hasn’t always been the case, but it is amazing how the pallet can change. Once a junk food, fast food and greasy food addict, I now find myself fully satisfied by natural healthy food. I love the absence of the groggy feeling that always came from the overindulgence of high fat processed items. I have grown to love the lack of hangovers and withdrawals from my life. This morning I woke up and got homework completed, cooked breakfast, and did some research regarding the Jehovah Witness view of creation and the age of the earth. My husband and I had a conversation about this topic yesterday, and I needed to go searching for the proper information to help sway his opinion. It seems that he was under the misinformation that Jehovah Witnesses do not believe in the scientific evidence that the earth dates back as much as 4 billion years. So I had to find out for my self, and to my joy, in the publication Was Life Created it is stated that geologists have shown that the earth is 4 billion years old and astronomers have formulated that the universe may be as much as 15 billion years old and that this does not contradict Genesis because it is an indeterminate amount of time that the creative days took. Fundamentalist Christians believe that the creation days were literal 24 hour days, however there is no foundation for this. Moses referred to all 6 creative days as one day, and even when Jehovah called the time of light day and the time of dark night, this indicates that the term day is relative to different periods of lengths of time. It seems that I have managed to poke a small hole in my husbands theory that he already knows all the answers that they are going to give him, and that they don’t agree with his view. I must have been visibly overjoyed and full of energy because my husband asked if I had gotten into his coffee and was high on caffeine. This was not the case, I was just full of joy and a spiritual contentment. I hope that over time I can begin to inch through some of the things he is so convinced that he has to fight against. At least this is one we can mark off the list. However back to my Kebabs, I used a combination of mushroom, onion, sweet mini bell peppers, and boneless skinless chicken tender pieces. The chicken tenders were marinated in greek yogurt, garlic powder and dill. Cut all the veggies and chicken into about 1 inch cubes and skewer alternating items leaving space for even cooking. Grill the skewers on a hot BBQ until the vegetables have a lovely char and the chicken tender cubes are cooked all the way through. I officially made it through the first week of school without any major problems. Adjusting to the extra work is harder then I thought, but it is all falling into place. I have managed to walk with my dog a mile every day. Tomorrow is the 1st, and I have planned to extend the walk to 2 miles! I have been doing the 1 mile walk for 2 weeks now, so I think I am ready to up the distance. I will take it easy, and of course have my phone, in case there are any problems. I am so happy with the progress I have made so far. I finally broke the 280 mark, my weight is down to 278. That is down 32 pounds from when I got home from the hospital January 6th. I have officially been free of alcohol, cigarettes, salt and caffeine for 122 days. Hard to think back to just one month ago, I could barely get down the driveway to the mail box. It is amazing what a difference good nutrition, good doctors, positive attitude and a spiritual foundation can make! I have fallen behind on posting here, but I also have fallen behind on making fun food. Have to admit there have been a few nights of salads, and bowls of fruit. This meal however was super yummy, and pretty easy! Mix the greek yogurt, dill and honey mustard together and coat the chicken tenders. Place in covered container in fridge and let flavors mingle for about an hour. Pre-heat oven to 375° place chicken tenders on a baking sheet and bake for 30-45 min depending on size, turning once. Always cook chicken until there is no pink left in the middle. The rice is just prepared as indicated on package, and topped with spray butter and pepper. The Summer squash is sliced about 1/2 inch thick and grilled in a skillet that has been sprayed with butter flavor cooking spray. I love the flavor of summer squash so I choose not to season them, just let the natural grilled flavor come through. This is one easy, healthy and low calorie meal. It has definitely been the busiest week I have had in a long time! Between school work, workouts, grocery shopping, and housework I have been nonstop on the go! I have managed to get out and walk a mile everyday this week, except yesterday. Yesterday we had to go to town to do some shopping and by the time we were done it was way too hot to walk. This dish is a blend of light spring fish flavor and sweet glazed carrots and sweet potatoes. The sweet potatoes are kind of a heavier fall type meal, but they just sounded so good, I made them anyway. It was, like so many meals, just a process of starting with a taste for carrots and then next thing you know I decided I needed to sweeten them. So the addition of sweet potato, maple syrup, honey and cumin to the saute and this was the result. They turned out so yummy I wish I had made a larger skillet!! For the Tilapia, I seasoned it with Mrs. Dash Tomato Basil and Garlic Blend, splashed it with a touch of malt vinegar and topped each filet with halves of grape tomatoes. Place the Tilapia fillets in a pre-heated 375 degree oven and bake for 15 -20 min depending on the size of the fillets. Top the fillets with swiss cheese and continue to cook for 3-5 min to melt cheese. Here in Louisiana we are having exceptionally nice weather! It has not yet passed into the miserable humid weather, that we all know is on the cusp of rearing it’s ugly head! it was a clear and breezy 75 degrees today. This of course means another excelent day to fire up the grill! Tonight we had a wonderful dinner of grilled beef chuck eye steak and corn on the cob! It is a wonderful time of year for corn on the cob, and at the Winn-Dixie we picked up corn cobs for 10 for $3.00. The chuck eye steak is one of my favorites on the grill. I always pick out one with a great marbling of fat, which results in a wonderfully tender steak. The Hubby just goes with a simple salt and peppered steak for the grill, whereas I enjoy a marinade of Mr. Spice Garlic Steak Sauce and liquid smoke. No salt, no fat, no refined sugar, no cholesterol, gluten free, and wheat free. For the Corn on the cob, we made an unsalted butter mixture that consisted of 2 tbsp of unsalted butter, rosemary, dill and cilantro. You can mix whatever herbs in the unsalted butter you like. It all depends on your flavor pallet. We use different combinations all the time. We prefer to grill the corn in it’s own husk. To do this all you have to do is peal back the husk, and clean out the husk stringy inside. Make sure to leave the outer husk attached to the corn cob. Rub 1 tbsp of the unsalted butter mix on the corn cob, and re-cover the cob with the, still attached, outer husk. After firing up the grill, or heating the coals if you use a charcoal BBQ as we do, place the corn on the grill first. The corn cobs will take about 20 min to cook. To get an even grill on them turn a quarter turn approximately every 5 minutes. About half way through the corns cooking time, you should place the steaks on the grill. For a nice rare to medium rare you will only need to cook the steak for approximately 5 minutes per side. Turning once during grilling. The hubby also made dill hassle-beck potatoes and harm cheesy Hawaiian rolls to accompany the meal. Not that we needed all of it, I saved more than half of the steak and the potato for tomorrows breakfast.